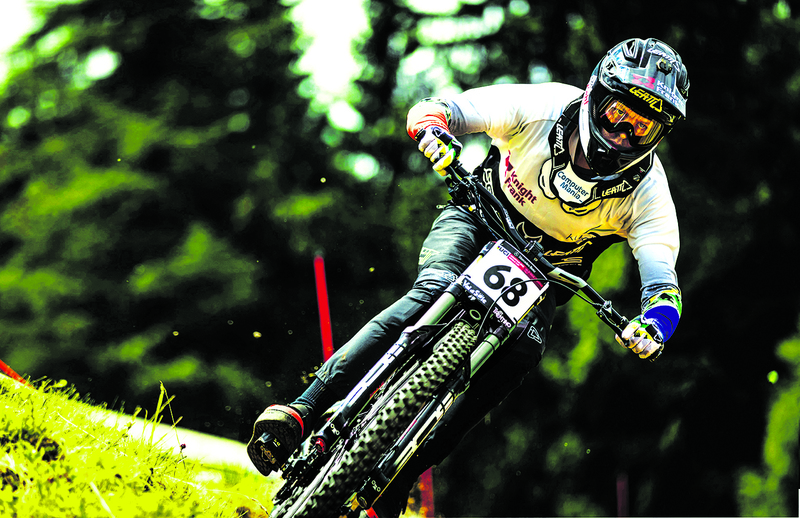 Our resident downhill ace has experienced a tough year. After his recent season-ending tumble, he reflects on the 2018 season. After having had my best season ever in 2017 I really thought that things would just keep going and be better in 2018. Unfortunately, things don’t always go according to plan. I really battled to get support going into the season and this created a lot of stress. I wasn’t I sure if I’d be able to manage the whole season as competing at World Cup level takes a lot of support and a lot of budget. Somehow, I did manage to get things together and got a decent amount of support although I had to skip the Mont Saint Anne World Cup due to lack of budget. On the positive side, physically on the bike I felt better than I ever had, and the speed was better than ever but just everything around that didn’t seem to be working. I started the year off in Croatia and ended up getting a flat tire before qualifying; then headed up to Fort William and got another flat tire and qualifying. Both of those were extremely disappointing for me because they were freak incidents. The speed was really good, and those tracks should’ve been really good results for me. 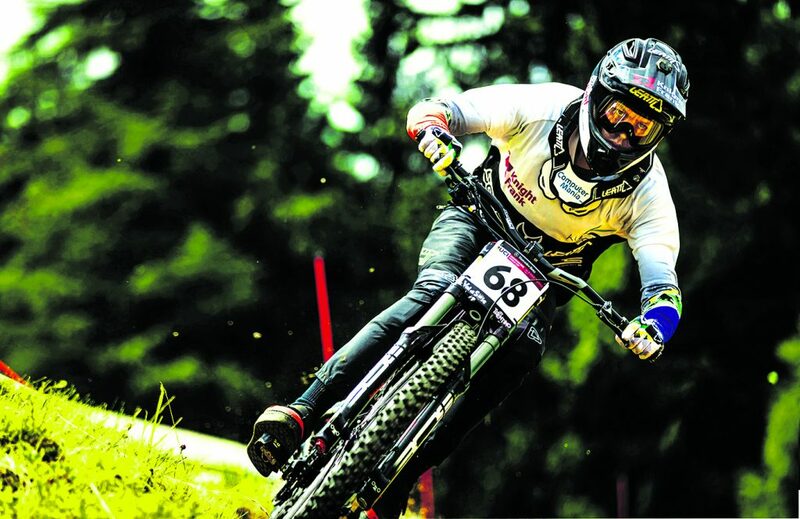 Next up was Leogang and I finally had a decent result getting 48th which would end up my best of the year. Val Di Sole was next which was my best result last year. I felt amazing there and ended up being sixth at split One and then caught another rider and while trying to pass him, I ended up going down. Andorra was next, and I got another flat tire in qualifying from a freak incident where my valve snapped off. It was just a crazy run of events. At this point I was really down just because nothing has been working even though I felt so good on the bike and the speed was great at every single event. Nothing seemed to be working out and I wanted to have a little break to have a bit of a reset for the rest of the season. So, we headed to Morzine for a couple weeks just to have some fun and that was really good for me to get into a better mind-space. I decided to do a German cup event in Ilmenau which I had won the last time I was there. Sometimes it’s good to do an event with a bit less pressure and hopefully it would be a good chance to get in a better space going into the last couple of World Cups. However, as with the rest of the year, things didn’t go to plan and in my seating run I ended up getting out of control, hitting a tree and broke my femur which put an end to my season. This is by far my worst injury, but after the year had gone I just felt that it almost needed to happen to give me a chance to reset and have a long break because mentally I was just over it. Now I have a lot of time to really think about things and hopefully get re-motivated. This year taught me a lot and showed me that you really need to appreciate things when you have them as they can change in a heartbeat. Last year everything seemed to be rolling and going perfectly as every result was good and I smashed all my personal goals. A year later it feels like everything fell apart and most of it was out of my control. However, we always learn something and generally you learn the most when things aren’t going well. I’m really grateful to still be in this position and things could always be worse. You need to learn to fail before you can learn to win so I’m feeling good and going to use this as best I can to come back even stronger. Thanks to everyone who is been behind me this year and through my whole career. I’ll be back even stronger and better than before!